Up at 6:00 to re-create my Day 4 post and start Day 5. Tad and Baker, their yellow lab joined me about 6:30 and Tad started breakfast, pancakes and bacon. Glitch in the plan, no syrup. I made a run to the local market for maple syrup, my contribution. We ate the giant cakes, packed up and said goodbye to our hosts. L to R: Bob, me, Tad, Dave and Brian. The horse paddock and our campground for the night in the background. 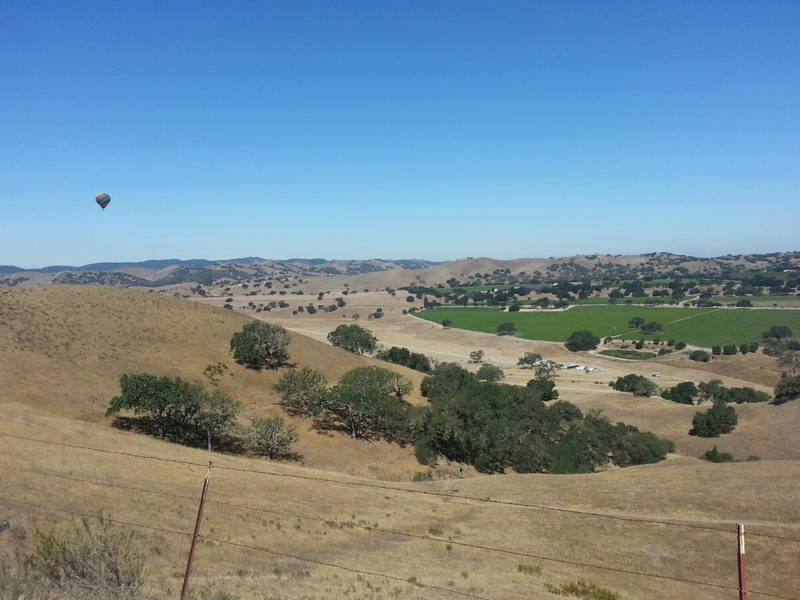 After consulting with Tad and Anna, we decided on taking Foxen Canyon Road to Santa Maria because it was take us past vineyards and farmlands. 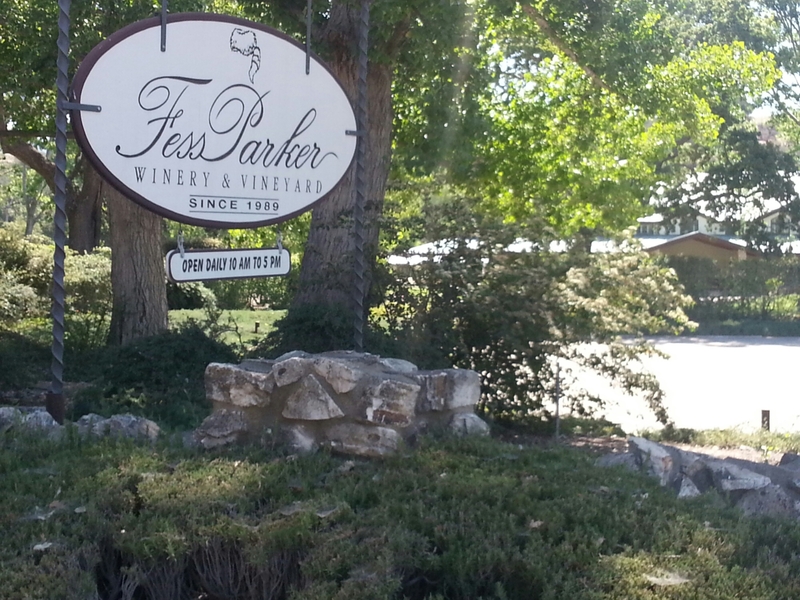 Fess Parker Vineyard. For those born after 1960, he started in a TV western. We passed the time in a philosophical discussion with Bob. He has been thinking for the past two days about whether a person could be justly praised for doing something wrong. He mostly discounted Brian and my inputs. 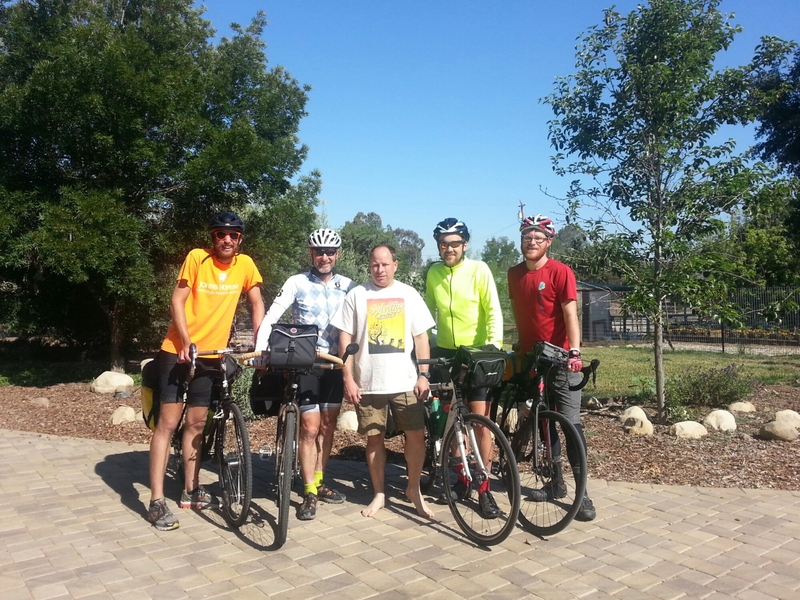 After 37 miles, we arrived in Santa Maria. Our food Macs, Bob, wanted to see what the tri-tip was all about. We’ve seen it advertised all along the trip. Paddy’s restaurant had a big sign advertising tri-tip sandwiches and we were sucked in. Turns out, it is a cut from the sirloin that it’s only done in California (according to our waitress), not that impressive. Dessert was at the roadside stand next door. Bob bought a triple tray of giant, mutant strawberries, we sat on a railing and consumed the whole tray. The girl at the stand was impressed, or appalled, not sure which. 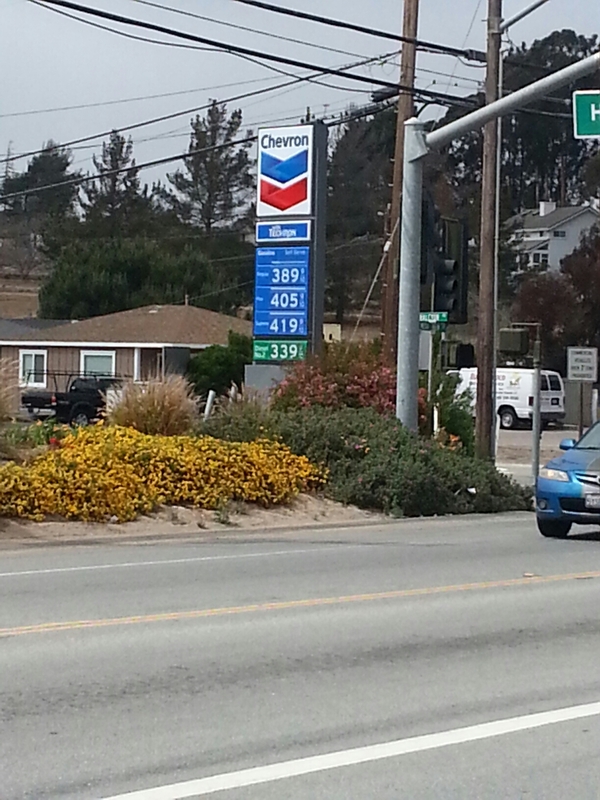 The ride out of Santa Maria to get back to the PCH was a slog into the worst headwind and bad roads so far. Brian took the lead and pulled us through. Thank goodness. Down the road to Oceano and the dunes recreation area. We could hear motorsports activities over the hill. Our destination was San Luis Obispo, home of Cal Tech. We got there around 5:00 and had a beer while waiting for our host to respond. On Bob’s suggestion (demand), we had Thai food for dinner and headed for our host’s house. Nick shares a house with three other students. The house is like off-campus housing, if you catch my drift. They are all very nice and very inviting. They’ve allowed is to sleep on their living room floor (once they determined we weren’t going to murder them in their sleep). It will be nice but to have to pack up a damp tent. It was another 79 mile day into strong headwinds. Tomorrow’s plan is for a short, 50-ish ride to San Simeon and Hearst Castle. Do people not have tri-tip elsewhere? My understanding from all the meat eaters here is that if it’s done right, it’s delicious. If regular gas is under $4 it’s a good day.